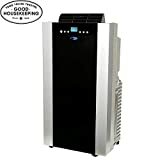 Whynter - ARC-14SH : Air Conditioner Review • The Air Geeks, reviews of air conditioners, dehumidifiers and air purifiers. Well, Whynter is coming! Hmmm hmm. Sorry. The ARC-14SH is a powerful system that is designed to deliver an impressive cooling capacity of 14,000 BTU. It is based on a dual hose design and it therefore offers a higher efficiency and better performance. If you are looking for a powerful air conditioner for your house, then this unit is specially engineered to cater for your cooling (61°F – 89°F) and heating (61°F – 77°F) needs. Bulky and heavy yet portable, this air conditioner will therefore be an ideal system for users looking for a one-stop (cooling + heating) solution. What is more, this unit is designed to also provide the functionalities of a dehumidifier… and a fan! Let us get technical here, and analyze the Whynter ARC-14SH in depth. For sure, the ARC-14SH is not small : this 35.5 inches-high unit, weighing 80 pounds, is, however, portable : the unit features four multidirectional wheels to facilitate movement from one place to another. There is therefore no need to carry or lift it. Furthermore, the unit is compact in design and measures 35.5 x 19 x 16 inches. What’s more, the ARC-14SH blends portability with a high cooling capacity to provide users with a truly powerful system. The three-in-one design makes sure that users in areas that experience season changes don’t need to buy three separate systems for their cooling, fanning, and dehumidification needs. 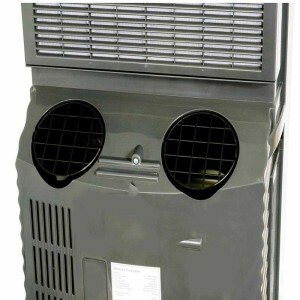 To start with, this air conditioner is engineered to deliver a high cooling capacity. This 14,000 BTU unit is suitable for a 500 square feet space. However, this estimate assumes average ambient space conditions and it may therefore vary depending on the design of a room. The high cooling capacity makes this system an ideal air conditioner for use in bedrooms, server rooms, living rooms, classrooms, and workshops to name a few. In order to prevent environmental pollution, this portable system is based on an eco-friendly technology, made to consume minimum energy. Moreover, it is a CFC-free air conditioner that employs environment-friendly R-410A refrigerant and RoHS-compliant components. You’re in the clean. To avoid accumulation of condensate in the collection tank, this unit features a highly efficient auto drain system. This design enables a user to run the unit for many days without worrying about water accumulation. In addition, the moisture that this air conditioner draws from the air is utilized to produce clean and cool air. The ARC-14SH is designed to deliver three functionalities: cooling, dehumidifying and fanning. When the unit is under cooling operation mode, it cools and dehumidifies simultaneously. When set to dehumidifying option, the unit dehumidifies the room without cooling. Lastly, the fan mode is for circulating air and offers four fan speeds. Furthermore, the unit has an adjustable thermostat with a temperature range of 61-89 degrees F.
It is easy to interact and adjust the settings of this air conditioner. To start with, it features a convenient remote and an easy-to-use control panel. The control panel is made up of simple selections and an LCD display. This interface enables users to change temperature and fan speed with ease, even though it doesn’t display the current room temperature. In addition, the unit features a 24-hour timer that activates or deactivates it at preset times as programmed by the user. This system employs a special air filtration mechanism to provide users with clean and fresh air. Its pre-filter is washable and users can clean it by rinsing or vacuuming it. Users are advised to replace its odor-neutralizing carbon filter after every eight to twelve weeks. The dehumidification function is weak. The dehumidification system of this unit is less effective than it should be, and a simple dehumidifier can beat it easily. Please remember that the ARC-14SH is primarily an air conditioner, and that all other functions are nice, but you shouldn’t rely on them! Auto restart after power outage? High efficiency. This unit is based on a dual hose design. This enables it to deliver a higher efficiency and better performance. Excellent cooling. This unit is powerful and delivers impressive performance. It brings the temperatures down within a short time. Non-impressive dehumidification and heating. This unit cannot be your first option for these two functions. However, as a backup, they are a nice addition. Less-than-silent operation. Some users have observed that most new units are noisier. With time, the noise reduces to tolerable levels. Works well considering its cooling a bigger area then its made for but it's just to back up the central ac unit that is poorly located on one side of the house so my kitchen and living room stay warm because the AC barely makes it there. It makes about the same amount of noise that a regular window unit of the same size would make on High setting because there is no high med or low Only the fan has those settings and when the compressor is on you cannot tell the by sound what level the fan is at, even the instructions tell you the same thing. You have to be carefull how you roll it, if you push it from the back it is top heavy and can topple over either push it backwards or sideways then face it the way you want. I have used it 10hrs a day for 2 weeks so far and have not had to empty the water I live in humid Florida so that's gotta be a plus. I would recommend depending on where you have it placed to go out and buy insulated tubbing that is bigger or some kind of water heater blanket and cover the Exhaust tube as it radiates heat . I bought 25' of ACHeat tubbing for that then used some of the rest to move the exhaust away from the Intake as they are right next to each other on the outside of the window." Great for all seasons. I use it year roiling. In the winter, I use it to keep a medium sized room warm but I often have to turn it off in the middle of the night cause it gets too warm in spite of setting a particular temperature. To use i n the winter regardless of the outside temperature, I expose exhaust vent to the outside and detach the intake vent so that it take in the indoor air and circulates it. This works perfectly to heat up the room even if outside temperature is below 45 degrees. I've added a couple of pictures to show what I mean." The Whynter ARC-14SH air conditioner is undoubtedly a powerful unit that delivers an impressive performance. With a cooling capacity of 14,000 BTU, it effectively cools a large space of up to 500 square feet within a short time. Its portability and its ease of use make it an ideal choice for many users who don’t want to install a permanent air conditioner. However, we warn our dear readers again : have a real dehumidifier and heater handy if you need these functions ; do not rely on the (fairly weak) functions of the ARC-14SH.